Weddings, families and groups looking for the perfect beachfront holiday home near Byron will find Barefoot at Broken exceeds all expectations. As a full-approved wedding venue in Byron Bay, this spacious beachfront estate includes a separate honeymoon suite with day-bed and verandah making it perfect for honeymoons, anniversaries and romantic breaks. Revel in the privacy of this contemporary hideaway which offers 5 bedrooms and 4 bathrooms (1 with bath, 1 disabled friendly, and 2 ensuites) in a series of private interconnected pavilions. Make plans to spend time with family and friends celebrating a milestone birthday, anniversary or wedding at this unique holiday rental which sleeps up to 14. Check out the luxury accommodation and lap pool with shallow area for wallowing with a book just a stone’s throw from the beach and rolling surf. Tucked away in tropical gardens, Barefoot at Broken is tailor-made for photo shoots, group holidays and family weddings – and pets are invited too! Call in the catering crew for larger private functions with a dining table for 20, or plan a BBQ and finger food in the private gardens and pool deck. Nestled between rainforest and beach, and just steps from peaceful wildlife and sand dunes of unspoilt Arakwal National Park, this is the perfect base for morning strolls enjoying the tranquillity. Look out for wallabies, echidnas, goannas and passing humpbacks whales in this natural haven. It’s hard to believe that Byron Bay’s bustling cafés, boutiques and nightlife are just 10 minutes drive away. But you may prefer to stay closer to home and frequent the Suffolk Park shops and pubs, just 3 minutes away by car. 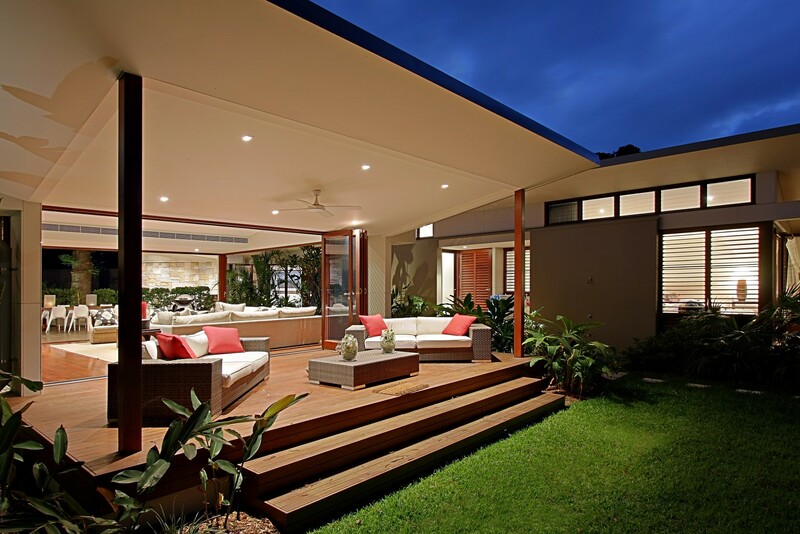 Set in the central pavilion, indoor and outdoor living areas blend in this luxurious property. 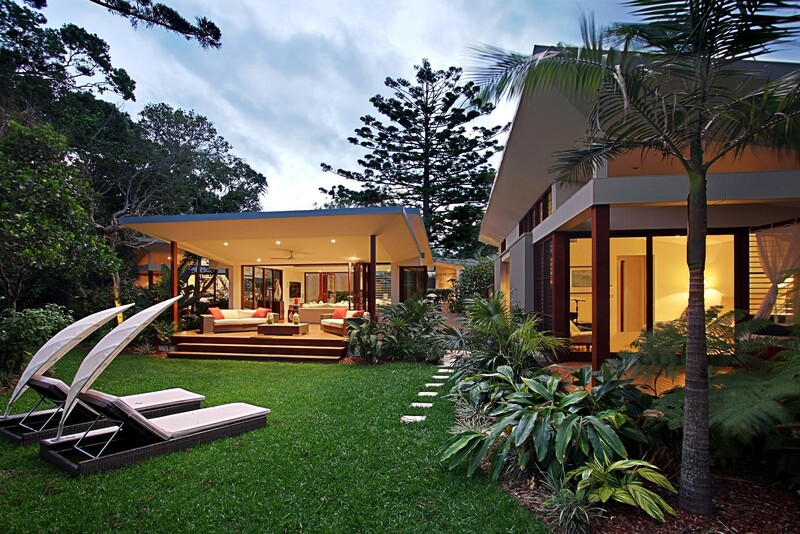 Bi-fold doors bring views of the tropical landscaping right into the open-plan living area which has a double-height ceiling, gleaming wood flooring and comfy cushioned seating around the large-screen TV. It’s a place to relax, close your eyes and dream, surrounded by soft music and a harmony of natural timber, stone and glass melding with the pastel coloured décor. After a day by the pool or surfing at the beach, this spacious area is a natural gathering place for social dining at the table in an atmosphere of comfort and luxury. The well-equipped kitchen is a chef’s dream and is fully equipped for catering for large parties and weddings receptions. The Jura coffee machine starts the day at a gentle pace but keen cooks may be inspired to create something more ambitious with the upscale Miele kitchen appliances including the double oven, microwave, cooktop and dishwasher. 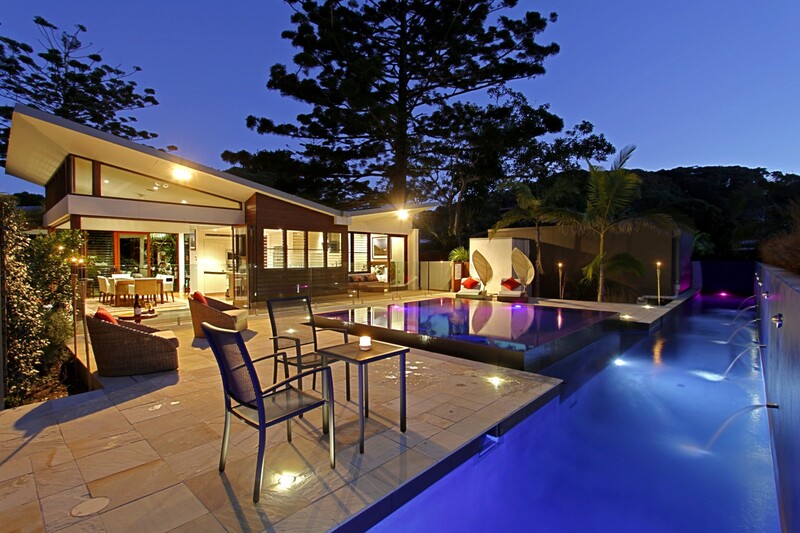 Plan a BBQ by the pool with friends or sip drinks and dine on the covered deck after dark. 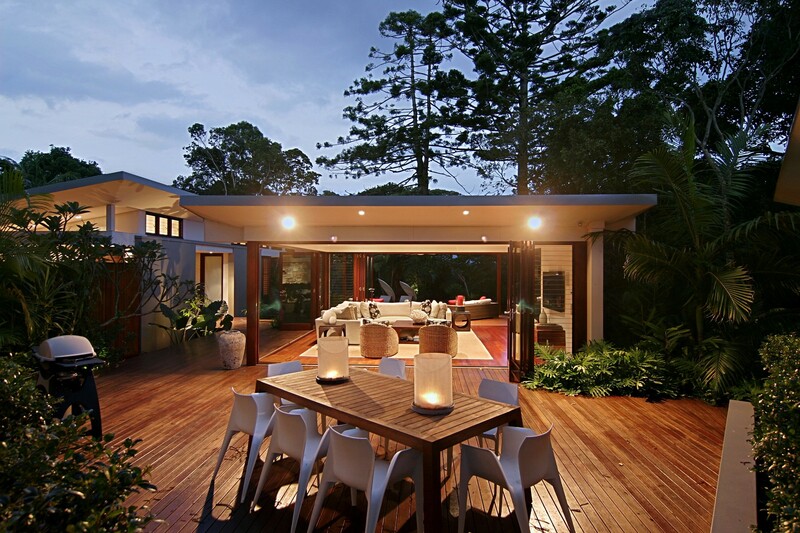 There are ample dining options in this well-planned holiday retreat in Byron Bay. Barefoot at Broken offers two independent pavilions providing privacy while still being part of the main holiday complex. 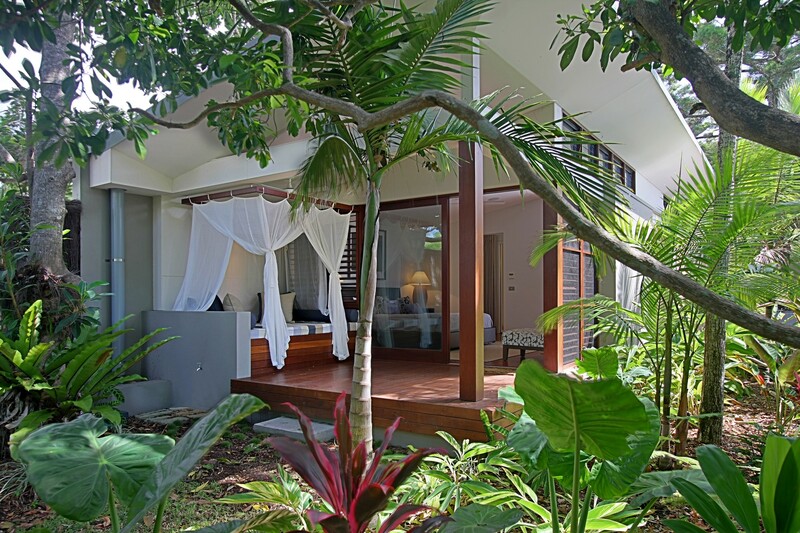 The Honeymoon Suite is separate from the main building with its own bathroom, terrace and alluring day-bed. The Garden Room is also in a separate pavilion with ensuite bathroom and doors opening onto the garden. The Piano Room and Little Fern Room are adjacent to each other to create their own pavilion. 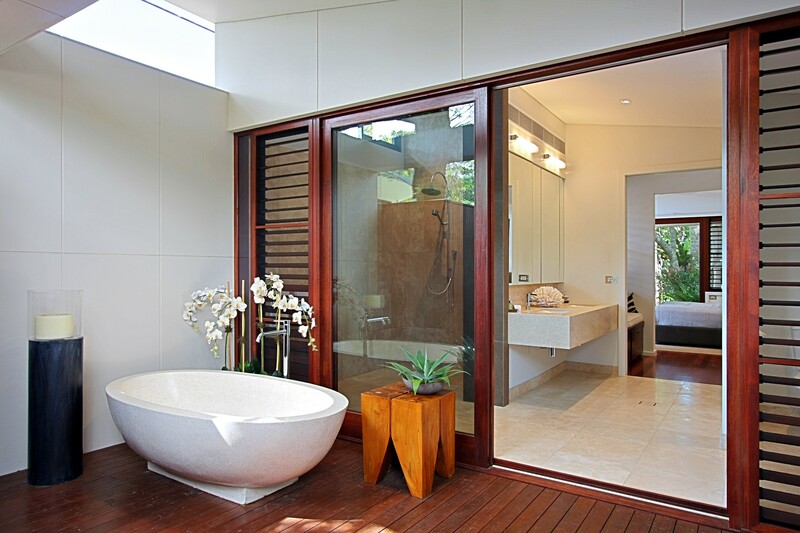 They share a bathroom which is accessed directly from/through the Piano Room, or along the outdoor deck/walkway (for guests in the Little Fern Room). Bedroom 1: Honeymoon Suite: 1 x king bed with private outdoor bath. Also 1 x single bed (suitable for child) plus one double daybed on verandah under nets for optional sleeping beneath the stars! Bedroom 2: Piano Room: 1 x king bed (or twin singles) and a 1.8m long single bed suitable for a child. Disabled bathroom shared with Little Fern Room. Bedroom 3: Little Fern Room: 1 x queen double (this former sunroom is an annex to the Piano Room and shares the bathroom). Bedroom 4: Poolside Room: 1 x queen bed (or twin singles) with private ensuite bathroom and access to pool. 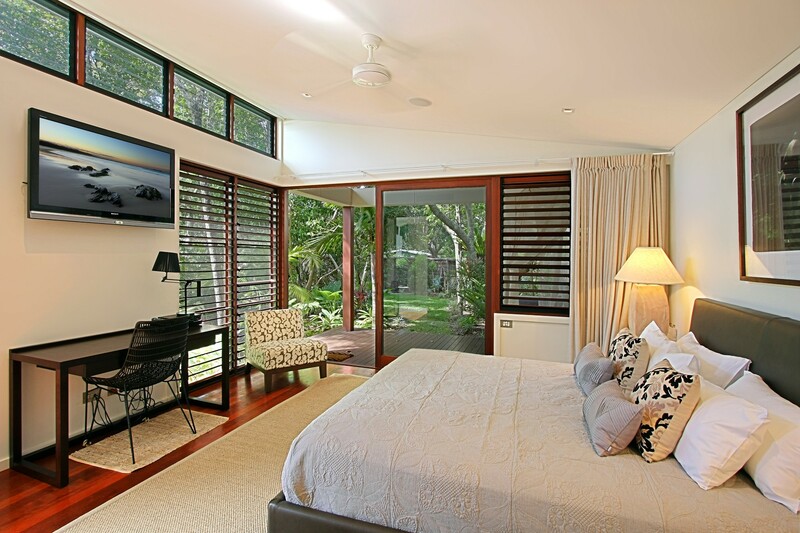 Bedroom 5: Garden Room with 1 x queen bed, ensuite bathroom and direct access to the garden. Additional single mattresses for children can be made up on the floor in the Honeymoon Suite and Fern Room, if required. Lush native plants screen the garden and provide different areas for dining and relaxing. The main terrace spills out from the living area and provides ample covered patio space for entertaining, BBQs or family dining beneath the starry sky. The pool is surrounded by another spacious deck. Dangle your feet in the wading pool or relax in the sun on comfy lounge chairs. Quieter space can be found on the Yoga Deck. You may even be tempted to catch an afternoon nap on the day bed on the private verandah attached to the Honeymoon Suite. 2 spaces are provided in the garage as well as one off-street disabled carpark. The pièce de résistance of Barefoot at Broken is its beachfront location. An easy 150m footpath through the dunes brings you onto the quiet sandy beach and rolling surf of Broken Head at the southern end of Tallows Beach. See the native Ti-trees in neighbouring Arakwal National Park just 3km down the road. It’s a place to share with rare native wallabies and goannas while listening to the sound of native birds. Whale-watching and dolphin-spotting are ideal from the Broken Head headland, or from the nearby Cape Byron Headland. Enjoy a refreshing stroll up the 3.7km Lighthouse Loop with panoramic coastal views before heading into Byron town for breakfast and shopping at the designer stores or food markets. Shopping, bars and restaurants can be found at Suffolk Park, 2km away, or in Byron Bay itself, 7km from your luxury holiday home. This is the only location in Byron Bay that is officially approved for weddings. Enjoy a barefoot wedding on the beach before returning to Barefoot at Broken for a catered reception poolside on the spacious deck and garden terraces, or indoors at the elegant dining table for 20. 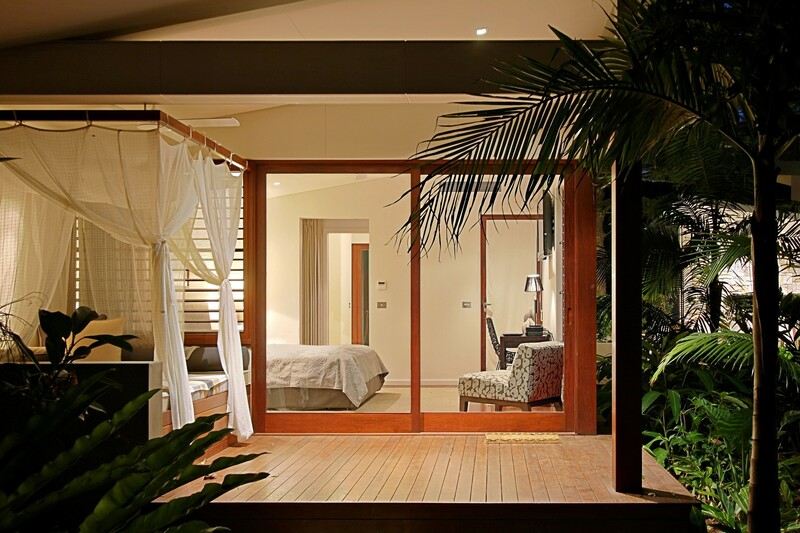 Separate pavilions allow overnight guests their own private space – and there’s a private honeymoon suite too. Barefoot at Broken offers the capacity of 70 guests. Curfew for non-staying guests 9pm. To hold a reception there is a four night minimum stay three nights midweek and a reception fee. Contact us for more information.